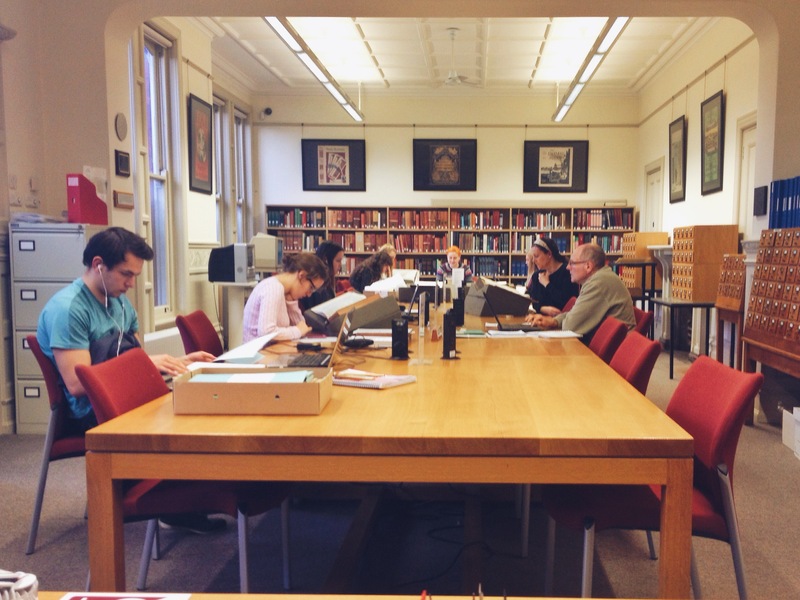 Our Reading Room Supervisor, Adam Lines, introduces a new feature for the University of Reading Special Collections blog. On a daily basis, members of the public, students and academics from around the world use our extensive and varied collections. In the Reading Room at one time, researchers can be consulting manuscripts from the Samuel Beckett archive, looking at engineering drawings as part of an engine restoration project, or exploring our photographic collections as part of a local history study. They play such a key role in our understanding of the things under our care. They bring with them specialist subject knowledge and shed light on aspects of archives that enriches our understanding of them. The view of the Reading Room from the supervisor’s desk. With this in mind, I decided it was time we shared some of the fascinating research carried out in our Reading Room. My colleagues and I hear about the research taking place on a daily basis, but a lot of it is too interesting not to share. As part of ‘Explore Your Archives’ week, we will be sharing some examples. This will be the start of a regular feature on the Museum of English Rural Life and University of Reading Special Collections blogs, and through the eyes of our researchers we hope to share the potential for discovery in our collections. Look out for more Reading Readers posts this week, and in the future. To find out more about accessing the archives, click here. This entry was posted in Reading Readers. Bookmark the permalink.